Bowfell (named Bow Fell on Ordnance Survey maps) is a pyramid-shaped mountain lying at the heart of the English Lake District, in the Southern Fells area. It is the sixth-highest mountain in the Lake District and one of the most popular of the Lake District fells for walkers. 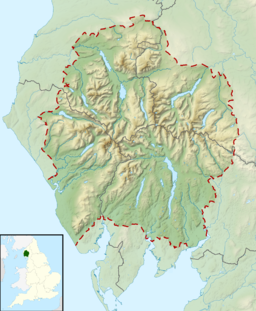 It is listed in Alfred Wainwright's 'best half dozen' Lake District fells. The Southern Fells include the highest ground in England, a horseshoe which begins with Scafell and Scafell Pike in the west and then curves around the north of Upper Eskdale to take in Great End, Esk Pike, Bowfell and Crinkle Crags. To the north-west of Bowfell the main ridge drops to the depression of Ore Gap, named after its reddish soil, rich in haematite. Below the col on the northern side is Angle Tarn. This round waterbody occupies a corrie beneath Hanging Knotts, small trout lurking in its 50 ft depths. Its outflow is a tributary of the Langstrath Beck, making for Stonethwaite. To the south of Ore Gap runs Yeastyrigg Gill, the main headwater of Lingcove Beck, flowing into the fastness of upper Eskdale. Beyond the Gap the ridge makes the stony three-tiered climb to the white-rocked summit of Esk Pike. Bowfell sends out two subsidiary ridges to the east. The Band is a descending rigg starting from the southern end of the summit plateau. It is this ridge which divides Oxendale from Mickleden, making straight for Stool End Farm on the valley floor. The Band has a minor top about halfway down named White Stones, although most guidebooks do not consider it notable. The second ridge begins at the northern end of the summit plateau and crosses Rossett Hause, a sharp depression at the head of Rossett Gill, to make for Rossett Pike. The continuation of this ridge provides the connection to the Central Fells, forming the northern wall of Great Langdale as it crosses Martcrag Moor, bound for the Langdale Pikes. The summit area is a ridge running north–south with the final pyramid near the south-west corner and crags on three sides. The southern face is formed by Bowfell Links, an impressive wall of crag scarred by nine vertical gullies and with corresponding tongues of scree at its foot. A climb up these is neither pleasurable nor safe as they are extremely active loose rock channels. The eastern face carries a wealth of features including Flat Crag, Cambridge Crag and the Bowfell Buttress, the latter two providing good climbing. Flat Crag includes the Great Slab, a remarkable tilted sheet of rock which looks exactly as it sounds. At the base of Great Slab a spring gushes forth from the bare rock. "And no water anywhere else tastes better." Below these faces runs the Climber's Traverse, a narrow path providing an excellent high-level walking route to the summit from the highest point of The Band. This largely horizontal line contours around beneath many of Bowfell's most dramatic crags, finally reaching the summit via a rocky route known as the River of Boulders, running parallel to the Great Slab. Finally on the north- east corner of the summit ridge is Hanging Knotts, a complex series of faces and outcrops looking down upon Angle Tarn. The highest point carries not so much a cairn as a rearrangement of some loose rock at the apex of the pyramid. The panorama is excellent, improved immeasurably by the steep final slope and lack of foreground. Every major group of fells in Lakeland is seen well from this superb vantage-point — the Helvellyn range from end to end and the Langdale Pikes across Langdale — but the piece of the view is Scafell Pike towering above Eskdale. The Band provides the most popular means of ascent. Other routes from Langdale climb via Rossett Gill and Three Tarns. Bowfell can be reached from Stonethwaite via Angle Tarn although the way is long. Equally time-consuming although perhaps more picturesque is the long march up Eskdale from Brotherikeld, gaining the ridge at either Ore Gap or Three Tarns. 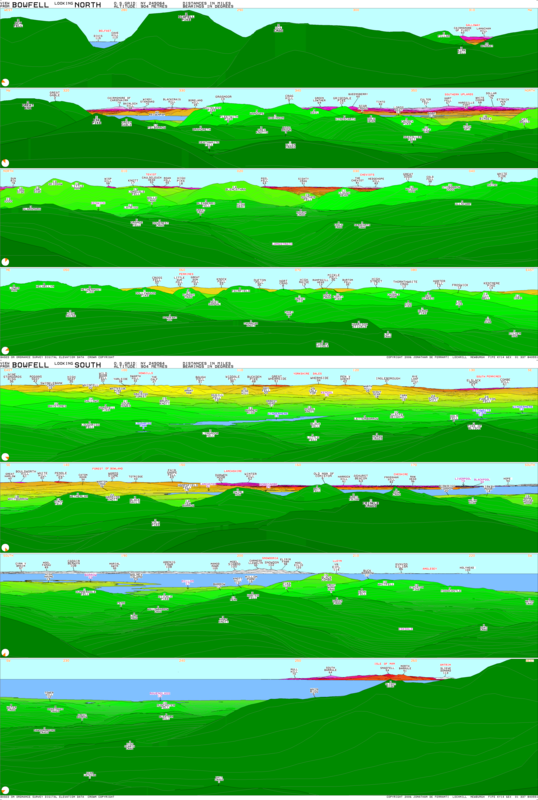 Indirect climbs can also be made via Crinkle Crags, Esk Pike or Rossett Pike. The summit can also be reached from the top of Wrynose Pass by following the Right of Way starting close to the Three Shire Stone and heading in a northwesterly direction. The route takes in the summits of Cold Pike and Long Top. Wikimedia Commons has media related to Bowfell.